Marketing has gone inbound and it needs content to support it. 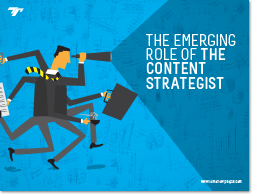 Marketing communications planning has become a lot more tactical, and needs a content strategist to guide it. There are more than 3.5 billion pieces of content (web links, news stories, blog posts, etc.) shared each week on Facebook. B2B companies with over 40 landing pages generate over 10 times more leads than those with only one to five landing pages. 66% of buyers indicate that ‘consistent and relevant communication’ is a key influence in choosing a provider. Segmented emails get 50% more clicks. 53% of people on Twitter recommend companies or their products in their tweets. 45 million people view SlideShare presentations each month. 41% of B2B companies have acquired customers through Facebook and 57% through their company blog. Companies that blog have 97% more inbound links and 55% more web traffic. Understands the impact of all content at each stage of the customer journey and how to optimise it. Defines which content will be published and why, when and where. Creates processes based on data analysis results, which take into account both big picture vision and fine details, to continually improve the content delivered in the strategy.